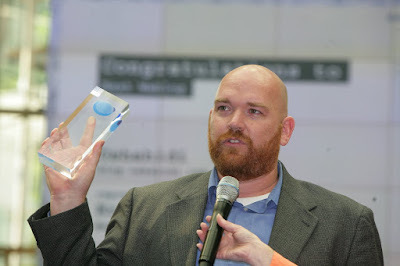 Delighted to see Erik Hersman, one of the founders of the Ushahidi software project in Nairobi, Kenya get recognition for their efforts in Kenya and Haiti. They picked up the Best of Blogs award at Deutsche Welle's "Oscars" for the Blogosphere (the BOBS). Actually, Ushahidi is more than a blog. It's a great crowdsorucing tool, which I am integrating into a radio station project in East Africa. Contact me if you want to know why! It looks like Amsterdam's New Media festival Picnic has finally run out of steam. Sorry, but these are NOT the issues that people "in the media" are still intensely debating about. If this is what their advisers are telling them, then it looks to me that Picnic is following the path of the Internet Professionals Association Netherlands IPAN. It started with a great mix of creatives, marketeers and technicians. Because they didn't expand the scope of the programme, the creatives left, followed by the technicians. Picnic is now just a performance about life, the universe and everything at the former gas works in Amsterdam. No focus, No discussion, No point. Speakers are herded off into VIP tents so they can mix with the sponsors, in short the whole thing is now an embarrassing shambles. Picnic has been replaced by The Next Web, NPOX and Mobile Monday Amsterdam - focused, fast and friendly. The ambition to be like a European SxSW never came off. I think people in Europe forget how radio can still draw huge crowds in East and West Africa. The secret is the ability to make programming in local languages. What is a doctor doing at a world mobile congress? Explaining why mobile phones can really empower African countries through telemedicine. The smartphones now make this possible. Personally, I see these kind of services linking up with community radio stations to provide far more interesting, relevant radio shows for the communities. This guy was one of the most passionate speakers I met in Barcelona. Too many health shows are "general" scripts translated into local languages.